The case study explores the challenges faced by premium brands and how they can protect their customers from grey market imports and counterfeit goods. These include lost sales, reputational damage, poor customer experience and even health and safety issues. The paper explains how the Old Kempton Distillery and local systems integrator AusNFC developed and deployed a cloud product authentication service based on HID Global’s Trusted Tag Services that can help eliminate counterfeiting by allowing customers to authenticate their bottles at the time of purchase. The paper then outlines the benefits of using the system, including its ability to allow the distillery to stay connected with consumers and communicate with them in a privacy-preserving manner from the time of sale onwards. 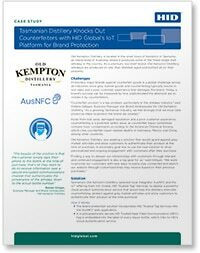 ‘Case study: Tasmanian distillery knocks out counterfeiters with HID Global’s IoT platform for brand protection’ has been produced and sponsored by HID Global and approved by the NFC World editorial team. This two-page case study is available free of charge to NFC World Knowledge Centre members (PDF format, 254kB). This item is part of the NFC Technology Knowledge Centre.